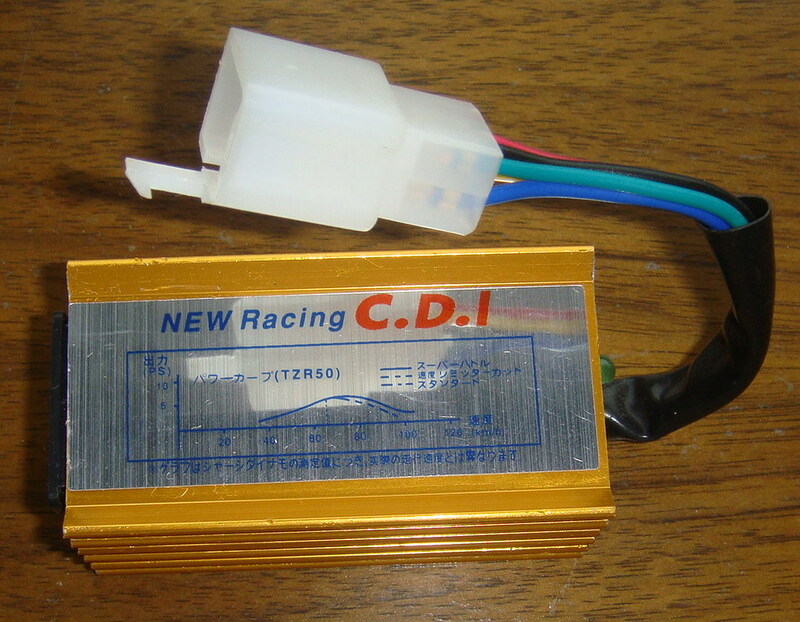 Capacitor discharge ignition (CDI) or thyristor ignition is a type of automotive electronic ignition system which is widely used in motorcycles. It was originally developed to overcome the long charging times associated with high inductance coils used in inductive discharge ignition (IDI) systems, making the ignition system more suitable for high engine speeds (for small engines, racing engines and rotary engines). The capacitive-discharge ignition uses capacitor discharge current output to fire the spark plugs. A typical CDI module consists of a small transformer, a charging circuit, a triggering circuit and a main capacitor. First, the system voltage is raised up to 250 to 600 volts by a power supply inside the CDI module. Then, the electric current flows to the charging circuit and charges the capacitor. The rectifier inside the charging circuit prevents capacitor discharge before the moment of ignition. When the triggering circuit receives triggering signals, the triggering circuit stops the operation of the charging circuit, allowing the capacitor to discharge its output rapidly to the low inductance ignition coil. In a CD ignition, the ignition coil acts as a pulse transformer rather than an energy storage medium as it does in an inductive system. The voltage output to the spark plugs is purely dependent on the design of the CD ignition. Voltages exceeding the insulation capabilities of existing ignition components can lead to early failure of those components. Most CD ignitions are made to give very high output voltages, but this is not always beneficial. When there's no triggering signal, the charging circuit is re-connected to charge the capacitor. The amount of energy the CDI system can store for the generation of a spark is dependent on the voltage and capacitance of the capacitors used, but usually it's around 50 mJ, or more. A CDI system has a short charging time, a fast voltage rise (between 3 ~ 10 kV/μs) compared to typical inductive systems (300 ~ 500 V/μs) and a short spark duration limited to about 50-80 µs. The fast voltage rise makes CDI systems insensitive to shunt resistance, but the limited spark duration can for some applications be too short to provide reliable ignition. The insensitivity to shunt resistance and the ability to fire multiple sparks can provide improved cold starting ability. Since the CDI system only provides a short spark, it's also possible to combine this ignition system with ionization measurement. This is done by connecting a low voltage (about 80 V) to the spark plug, except when fired. The current flow over the spark plug can then be used to calculate the temperature and pressure inside the cylinder. In a CDI system, the system charges a capacitor by default, and during the ignition point the system stops charging the capacitor, allowing the capacitor to discharge its output to the final coil before reaching the spark plug. 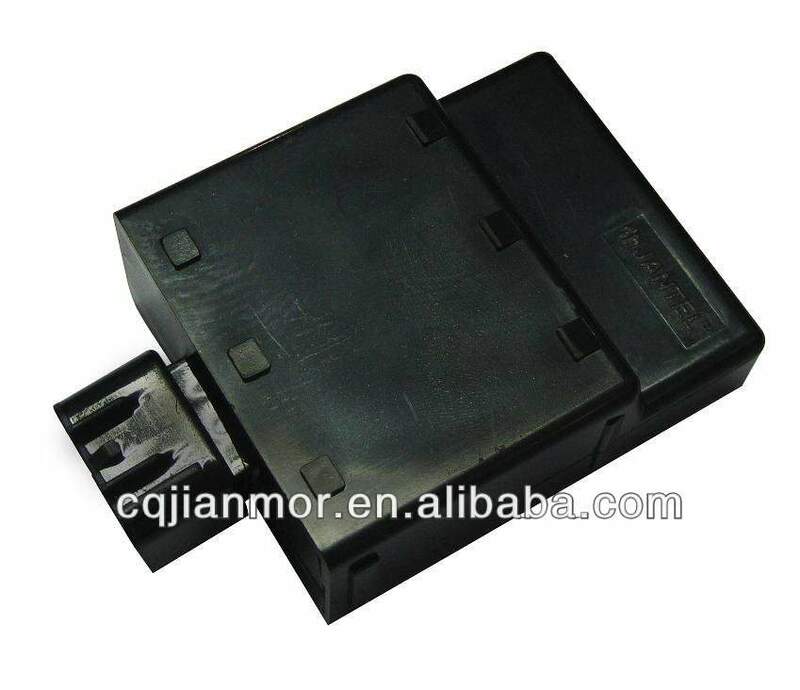 A typical CDI module may consist of a small transformer, a charging circuit, a triggering circuit and a main capacitor. Firstly, the system voltage is raised up to 400 V by a transformer inside the CDI module. Then, the electric current flows to the charging circuit and charges the capacitor. 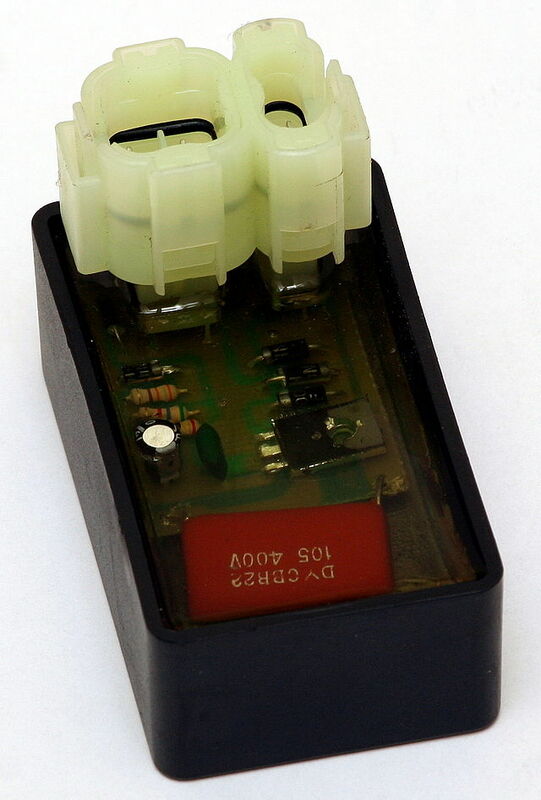 The rectifier inside the charging circuit prevents capacitor discharge before the ignition point. When the triggering circuit receives triggering signals from triggering devices such as Hall effect sensor or pulse generator during the ignition point, the triggering circuit stops the operation of the charging circuit, allowing the capacitor to discharge its output rapidly to the ignition coil. The rapid capacitor discharge then produces a very high voltage at about 40 kV to be fired at the spark plug. When there's no triggering signal, the charging circuit is re-connected to charge back the capacitor. Under normal circumstances, a CDI-type ignition system requires very little attention aside from regular spark plug changes. Some motorcycles allow for some adjustment in the ignition timing, which changes the points at which the source and pickup coils are triggered, by using a movable coil plate. Ideally, the pickup coil should trigger the ignition coil just before the engine's piston reaches the top of its stroke. Moving the plate against the flywheel's rotational direction advances the timing and creates a spark sooner. Alternatively, moving the plate in the same direction of the flywheel retards the timing, generating the spark later. A mark along the edge of the coil plate will indicate the timing position relative to the position of the piston. Adjustments to the ignition timing are not usually required unless the motorcycle is being used for competition. Such adjustments can affect the machine's reliability unless performed carefully. Most CDI ignition problems experienced in a street-ridden motorcycle originate within the charging system or battery. In order to generate the current needed to produce a spark, the battery must supply the CDI box with a full 12-volt current. Unfortunately, the battery must also power the motorcycle's lights as well. If your motorcycle's engine turn over, but doesn't start, completely charge the battery with an automatic battery charger before checking anything else. If the motorcycle still refuses to start, perform tests with a multimeter to determine if the CDI box incurred damage. Factory service manuals provide the testing procedures and CDI box specifications needed by your motorcycle.